Celebrating holidays does not mean that you have to break the bank. Especially for families who are on a budget or are trying to trim down their expenses, there’s no need to go all out for a holiday just because it’s a holiday. 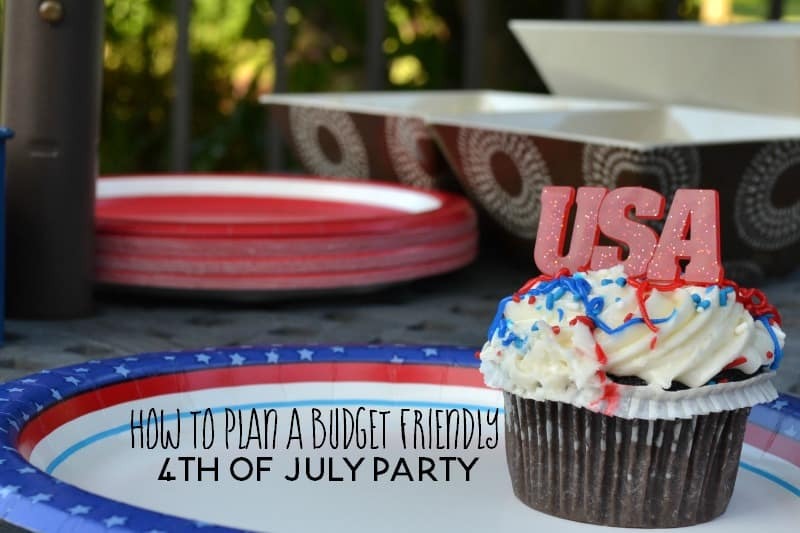 We’re going to start sharing more budget friendly party ideas and we’re going to start with budget friendly 4th of July party ideas. I also considered putting this under budget friendly holiday celebrations, so take it as you will- I think either or works, you know? Red, white and blue decorations and patriotic decorations come out before Memorial Day, so you should be able to find an abundance at your local dollar store. Homemade 4th of July decorations are easy to make and you probably have some or most of the supplies you’ll need already on hand. Glue the painted sticks together in an alternating pattern by gluing them to one craft stick on the right side and two broken craft sticks in the middle and on the left side. Cut a small square of blue construction paper and color white stars using a white gel pen. When the glue has set, turn the flag over. Glue on the square of blue construction paper and glue another craft stick to the long craft stick on the back. Let the glue set. Cut out large stars using red, white and blue construction paper. Decorate as desired. Fold over one tip of each star and staple or glue to desired length of red or blue string. You can use these to decorate the railings of your porch or deck, the stairway, mantle- get creative! Chicken: You can usually buy chicken on sale really cheap. So, before the 4th is upon us, be checking your local store’s weekly sales paper for chicken on sale, then stock up. You can make great bbq chicken on the grill. Corn on the Cob: Summertime is the best time to get inexpensive corn on the cob. You can grill it in their husks right along with the BBQ chicken! Watermelon: Watermelon is one of the most expensive foods for the amount you get. You can make watermelon salads, fruit bowls and other yummy side dishes that will fill your family and guests up! • Have a backyard party and have everyone bring a dish to pass. • Add sparklers to your burgers when serving them. • Don’t pass up invites to friends or family who are having backyard parties and take a dish to pass. • Don’t feel like you have to go all out with decorations. Simply using red, white and blue paper plates, cups and napkins will give your home a patriotic feel. • Use a vase you already have and fill it with flags from the dollar store. Give one to guests as they arrive too. Celebrating the holidays does not have to break your budget. What tips do you have to share for celebrating a budget friendly 4th of July?